O God, by whose favour we celebrate the festivals of thy holy Martyrs, Sixtus, Felicissimus and Agapitus; grant we may enjoy their fellowship in eternal bliss. Through our Lord Jesus Christ, thy Son, who liveth and reigneth with thee, in the unity of the Holy Ghost, God, world without end. Amen. “Xistum in cimiterio animadversum sciatis octavo iduum augustarum die. 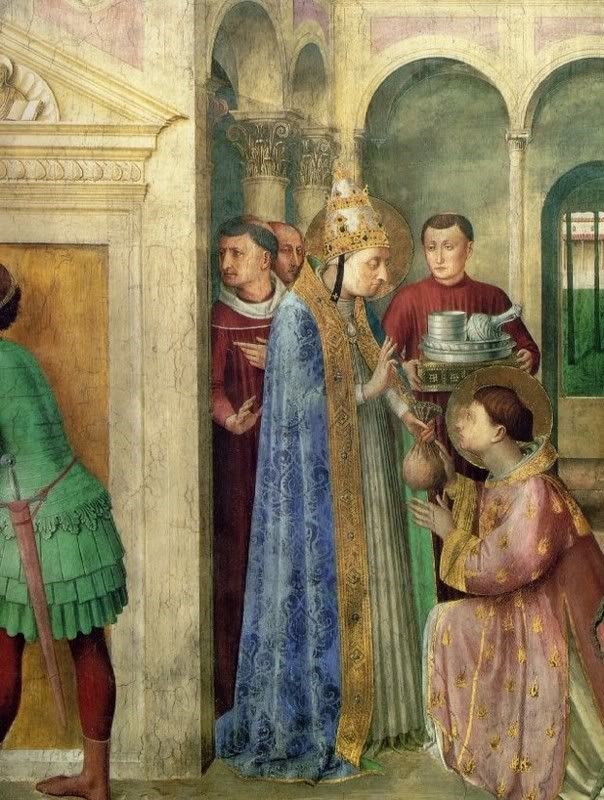 Know that Sixtus has been beheaded in the cemetery on the 8th of the Ides of August.” These words of St. Cyprian mark the opening of a glorious period, both for the cycle and for history. From this day to the feast of St. Cyprian himself, taking in that of the deacon Laurence, how many holocausts in a few weeks does the earth offer to the Most High God! One would think that the Church, on the feast of our Lord's Transfiguration, was impatient to join her testimony as Bride, to that of the Prophets, of the Apostles, and of God himself. Heaven proclaims him well-beloved, the earth also declares its love for him: the testimony of blood and of every sort of heroism is the sublime echo wakened by the Father's voice through all the valleys of our lowly earth, to be prolonged throughout all ages. Let us, then, to-day salute this noble Pontiff, the first to go down into the arena opened wide by Valerian to all the soldiers of Christ. Among the brave leaders who, from Peter down to Melchiades, have headed the struggle whereby Rome was both vanquished and saved, none is more illustrious as a martyr. He was seized in the Catacomb lying to the left of the Appian Way, in the very chair wherein, in spite of the recent edicts, he was presiding over the assembly of the brethren; and after the sentence had been pronounced by the judge, he was brought back to the sacred crypt. There in that same chair, in the midst of the martyrs sleeping in the surrounding tombs their sleep of peace, the good and peaceful Pontiff received the stroke of death. Of the seven deacons of the Roman Church, six died with him; Laurence alone was left, inconsolable at having this time missed the palm, but trusting in the invitation given him to be at the heavenly altar in THREE DAYS’ TIME. Two of the Pontiff's deacons were buried in the cemetery of Prætextatus, where the sublime scene had taken place. Sixtus and his blood-stained chair were carried to the other side of the Appian Way into the crypt of the Popes, where they remained for long centuries an object of veneration to pilgrims. When Damasus, in the days of peace, adorned the tombs of the saints with his beautiful inscriptions, the entire cemetery of Callixtus, which includes the burial place of the Popes, received the title “of Cæcilia and of Sixtus,” two glorious names inscribed by Rome upon the venerable diptychs of the Mass. Twice over on this day, did the Holy Sacrifice summon the Christians to honour, at each side of the principal Way to the eternal City, the triumphant victims of the 8th of the Ides of August. Sixtus II, an Athenian, was first a philosopher, and then a disciple of Christ. In the persecution of Valerian, he was accused of publicly preaching the faith of Christ; and was seized and dragged to the temple of Mars, where he was given his choice between death and offering sacrifice to the idols. As he firmly refused to commit such an impiety, he was led away to martyrdom. As he went, St. Laurence met him, and with great sorrow, spoke to him in this manner: “Whither goest thou, Father, without thy son? Whither art thou hastening, O holy Priest, without thy deacon?” Sixtus answered: “I am not forsaking thee, my son, a greater combat for the faith of Christ awaiteth thee. IN THREE DAYS THOU SHALT FOLLOW ME, THE DEACON SHALL FOLLOW HIS PRIEST. In the mean-while distribute amongst the poor whatever thou hast in the treasury.” He was put to death that same day, the 8th of the Ides of August, together with the Deacons Felicissimus and Agapitus, and the Subdeacons Januarius, Magnus, Vincent, and Stephen. The Pope was buried in the cemetery of Callixtus, but the other martyrs in the cemetery of Prætextatus. He sat eleven months and twelve days; during which time he held an ordination in the month of December, and made four priests, seven deacons, and two bishops. The Liturgical Year - Time after Pentecost, Vol. IV, Dublin, Edition 1901. Also Read – August 6, 2018: Transfiguration of our Lord Jesus Christ. Ss. Pope Sixtus, Felicissimus and Agapitus, pray for us.